6 Stamps Of Service History. New MOT & Full Service Done on purchase + 2 Years FREE Mot & Service Included After . 3 Months Russell Ham Quality Warranty . All Car's Are HPI Clear . Finance Arranged - Credit Card's Accepted . 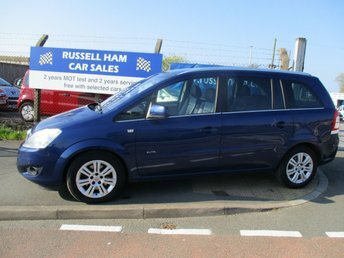 for more cars www.russellham.co.uk Spare Key & Owners Book Pack..
An incredibly popular people mover, the Vauxhall Zafira has long been the darling of UK motorists when it comes to finding a spacious and impressively flexible family car that's not short on style either. Better still, the Zafira is also fun if you're behind the wheel thanks to plenty of power and responsive handling. 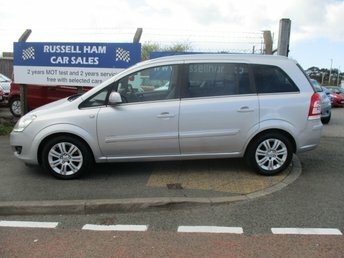 Come and experience one of the used Vauxhall Zafira models for sale in Plymouth for yourself by getting behind the wheel. Arranging a test drive is simple, just contact a member of the showroom team at Russell Ham Car Sales today. Rest assured we'll always go the extra mile to help you find the car that's perfect for your needs. Finance is available to UK residents aged 18 years or older, subject to status. Terms & Conditions apply. Indemnities may be required. Other finance offers may be available but cannot be used in conjunction with this offer. We work with a number of carefully selected credit providers who may be able to offer you finance for your purchase, commission may be received. We are only able to offer finance products from these providers. Postal Address: Russell Ham Car Sales, 112 Laira Bridge Road, Prince Rock, Plymouth, Devon PL4 9LR. Find contact details here. Russell Ham Car Sales Ltd is authorised and regulated by the Financial Conduct Authority, FRN: 669250. All finance is subject to status and income. Written Quotation on request. We act as a credit broker not a lender. We work with a number of carefully selected credit providers who may be able to offer you finance for your purchase. We are only able to offer finance products from these providers. Russell Ham Car Sales Ltd registered office: Russell Ham Car Sales Ltd, Britannia Garage, 4 Wolseley Road, Milehouse, Plymouth, PL2 3BH.